eCopy PaperWorks is an easy to use PDF editing suite from Nuance with advanced tools for PDF editing. RECORDLINK4PaperWorks appears as a toolbar within PaperWorks and provides seamless integration between PaperWorks and the SIMS Document Management Server. The RECORDLINK4PaperWorks wizard, launched from eCopy PaperWorks, allows fast opening of PDF, TIF and JPEG files from SIMS, and a simple method of saving new files to single or multiple SIMS student records, creating any database entries such as Achievements on the way. Many schools now benefit from networked photocopiers with extremely good scan functions. For others, workgroup scanners start from under £300. Equipped with a scanner simply scan the letter to your chosen pre-set network location. Return to your desk and open the letter as a PDF in eCopy PaperWorks. Click on Save To SIMS and save it to the student's record in SIMS, creating the medical condition of asthma as you go. Hey presto. Less paper, more secure information. Rather than documentary evidence being collected in hard copy and redacted by hand, PaperWorks is used to easily collate scanned documents. The page drag and drop function is used to pull all relevant pages from various documents into one which can be redacted on screen. The final document is emailed to the LA from PaperWorks. 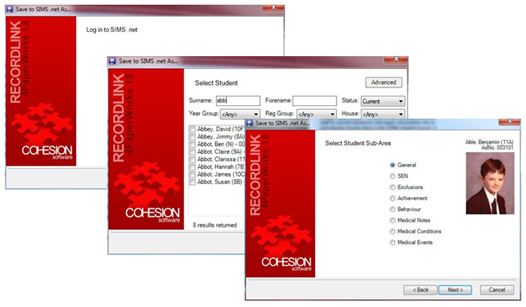 During the process RECORDLINK4PaperWorks is used to open documents from SIMS and save the final submission to the student record, creating the exclusion in SIMS at the same time.